Methane is the simplest hydrocarbon, with the chemical formula CH4. In chemical terms, it is classified as an alkane. At ordinary temperatures and pressures, it is a gas. It is a minor constituent of the Earth's atmosphere, but it is the main component of natural gas and biogas. Large quantities of methane have been found in sediments on the ocean floor, where it is trapped in cage-like ice crystals known as methane clathrates. 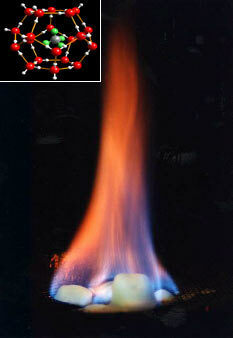 Methane is widely used as a fuel, but it is also a starting material for the synthesis of other compounds. In nature, it plays an important role as a "greenhouse gas"—a gas that helps trap the Earth's heat, preventing the heat from escaping into space. The Earth's mantle is the main reservoir of methane, and large quantities of this gas have been found in geological deposits known as natural gas fields. It occurs in association with other hydrocarbons and sometimes also helium and nitrogen. In general, natural gas is present in sediments buried deeper and at higher temperatures than those that contain petroleum. Natural gas fields are currently the main source from which methane is extracted for human use. Methane can also be extracted from coal deposits. It is the main component of the firedamp of coal mines. It is also emitted by mud volcanoes that are connected to deep geological faults. Biogas, produced by wetlands and landfills, is another source of methane. Biogas is a mixture of methane, carbon dioxide, and small amounts of other gases. It is generated by the microbial fermentation of organic matter—including manure, wastewater sludge, municipal solid waste, or other biodegradable feedstock—under anaerobic conditions. Biogas is also called swamp gas, landfill gas, or marsh gas, depending on where it is produced. "Burning ice." Methane clathrate consists of methane trapped in ice crystals. Upon heating, this material releases methane, which can burn. Inset: Molecular structure of a methane clathrate. Large deposits of methane have been found in a form known as methane clathrate, under sediments on the ocean floors. Also known as methane hydrate or methane ice, it consists of methane molecules held in cage-like, crystalline structures of frozen water. Methane clathrates are thought to be formed when methane gas streams rising from geological faults come in contact with cold seawater. One liter of methane clathrate solid would contain, on average, 168 liters of methane gas (at 25 °C and 100 kPa pressure). In addition to the above-mentioned sources, methane is produced by the digestive systems of ruminants, termites, rice paddies, and oceans , . Until recently, the consensus view has been that most of the methane from biological sources was produced by processes in oxygen-poor environments. In January 2006, however, a group of researchers reported that plants exposed to atmospheric levels of oxygen also constitute an important source of methane , . The researchers noted that "this newly identified source may have important implications for the global methane budget and may call for a reconsideration of the role of natural methane sources in past climate change." In the laboratory, methane can be produced by the direct reaction of carbon with hydrogen, or aluminum carbide with water. In industrial settings, methane is produced by chemical reactions between hydrogen and common atmospheric gases. At room temperature and pressure, methane is a colorless, odorless gas, lighter than air. At a pressure of 1 atmosphere, its boiling point is -161.5 °C (-258.7 °F) and melting point is -182.5 °C (-296.5 °F). It is highly flammable and reacts violently with oxidizers, halogens, and some halogen compounds. Each molecule of methane is small, consisting of four atoms of hydrogen attached to a single atom of carbon through covalent bonds. The molecule is shaped like a tetrahedron, with the carbon atom at the center and the four hydrogen atoms occupying the four corners of the tetrahedron. Unlike water molecules, which are polar and attract one another, methane molecules are non-polar and do not have much attraction for one another. This is the reason why, at room temperature, methane is a gas while water is a liquid. In methane, the carbon-hydrogen covalent bond is among the strongest in all hydrocarbons. In chemical terms, there is a high "activation barrier" to break this C-H bond—in other words, considerable energy is required to break it. Nonetheless, methane is still the principal starting material for the manufacture of hydrogen. The search for catalysts that can lower the activation barrier and other small-molecule alkanes is an area of research with considerable industrial significance. Here, X is either fluorine (F), chlorine (Cl), bromine (Br), or sometimes iodine (I). This reaction may continue, so that CH3X reacts with X2 to produce CH2X2; CH2X2 in turn can react with X2 to produce CHX3; and CHX3 can react further with X2 to produce CX4. Methane is not toxic, but because it is highly flammable it can form mixtures with air that are explosive. In addition, if it displaces oxygen within an enclosed space, and the oxygen concentration drops below 18 percent, it can lead to asphyxiation. For these reasons, commercially available methane is usually mixed with small quantities of odorants—strong-smelling sulfur compounds, such as ethyl mercaptan, to enable the detection of leaks. When structures are built on or near landfills, methane off-gas can penetrate the building interior and expose occupants to significant levels of methane. Some buildings have specially engineered recovery systems below their basements, to actively capture such fugitive off-gas and vent it away from the building. Scientists think that early in the Earth's history—about 3.5 billion years ago—there was one thousand times as much methane in the atmosphere as there is now. The earliest methane was released into the atmosphere by volcanic activity. In addition, ancient bacteria contributed to the methane concentration by converting hydrogen and carbon dioxide into methane and water. Oxygen did not become a major part of the atmosphere until photosynthetic organisms emerged later in Earth's history. In the absence of oxygen, methane stayed in the atmosphere longer and at higher concentrations than it does today. 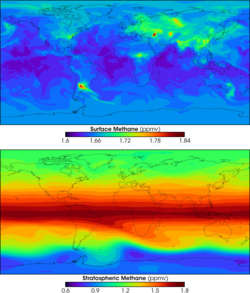 Currently, methane is a minor constituent of our planet's atmosphere. The average concentration of methane at the Earth's surface in 1998 has been estimated as 1,745 ppb (parts per billion) . Its concentration is higher in the northern hemisphere, as most sources (natural and human) are greater there. In addition, the concentration varies seasonally, with a minimum in the late summer. The main process by which methane is removed from the Earth's atmosphere is its reaction with the hydroxyl radical (·OH)—a reactive entity that may be produced when a cosmic ray strikes a molecule of water vapor. The chemical change can be written as follows. Two additional sets of processes that remove minor quantities of methane are: (a) the activity of aerobic microbes in soils, and (b) reactions with ·OH, ·Cl, and ·O(1D) in the stratosphere. Based on these processes, the estimated lifetime of methane in the atmosphere has been calculated to be 8.4 years . For more on the use of methane as a fuel, see: Natural gas. Methane is an important fuel. Being the simplest hydrocarbon, the combustion of methane produces more heat per gram than other hydrocarbons. In addition, compared to other hydrocarbon fuels, burning methane produces less carbon dioxide for each unit of heat released. In the form of natural gas, methane is regularly distributed via gas pipelines. In many cities, it is piped into homes for domestic heating and cooking purposes. Moreover, large quantities are burned to drive gas or steam turbines, to generate electricity. When biogas is used as a fuel, it provides a convenient way to turn waste into electricity. The process of producing biogas decreases the amount of waste to be disposed of and destroys disease-causing microbes that are present in the waste stream. The product, known as "synthesis gas," is a mixture of carbon monoxide and hydrogen. Synthesis gas is then manipulated to produce the intended products. Moreover, acetylene is prepared by passing methane through an electric arc. When methane is made to react with chlorine gas, various chloromethanes are produced: chloromethane, dichloromethane, chloroform, and carbon tetrachloride. The use of these chemicals, however, is declining. Acetylene may be replaced by less costly substitutes, and the chloromethanes are used less often because of health and environmental concerns. Methane in the Earth's atmosphere is an important "greenhouse gas" that contributes to the "greenhouse effect." The Earth absorbs some of the Sun's energy and then emits energy at longer wavelengths. Greenhouse gases (including water vapor, carbon dioxide, and methane) absorb the heat being emitted and prevent it from escaping into space. In this manner, greenhouse gases play a vital role in keeping the planet warm enough for human habitation. The current concern about global warming is based on reports that the concentrations of greenhouse gases have risen in recent years, mainly as a result of human activities, leading to an upward trend in the Earth's temperature . Some have contended that if this warming trend is not reversed, it could soon lead to dire consequences. This subject, however, is the focus of intense study and debate. In the case of methane, its concentration has reportedly increased by about 150 percent since 1750. In addition, its "global warming potential" is estimated to be 23 over a 100-year period. In other words, when averaged over one hundred years, each kilogram of methane warms the Earth 23 times as much as the same mass of carbon dioxide. Nonetheless, the rates of emission of methane by different sources in the biosphere are highly variable and difficult to assess. 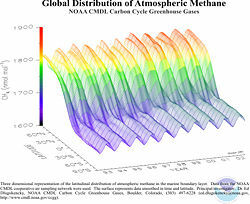 Consequently, it is difficult to predict future concentrations of methane in the atmosphere . Methane has been detected or is believed to exist in several locations of the solar system beyond our planet, as listed below. Traces of methane gas are present in the thin atmosphere of the Earth's Moon. Methane has also been detected in interstellar clouds. This page was last modified on 21 October 2014, at 16:00.